This page brings you the latest bird and wildlife sightings from Chew Valley Lake (and occasionally elsewhere). Most updates will be on a weekly basis, although they will probably be more frequent at busy times. Records are taken from various sources and should be regarded as unconfirmed. A Green Sandpiper was seen on Heron's Green Pool today. At least seven Water Pipits were on Heron's Green Pool today, and the first-winter Little Gull was on the main lake again. Another very early Sand Martin was seen over Moreton Bank this morning, and at least four Water Pipits were on Heron's Green Pool. Three Stonechats were on Moreton Bank, and six Mediterranean Gulls were seen in the roost this evening. Twenty three Black-tailed Godwits were watched circling the lake from Stratford hide - an unusual winter record for Chew. On the (now fully-drained) Heron's Green Pool there were two Water Pipits, and a Brambling was at Villice Bay. The Yellow-browed Warbler was again reported as being present, and the Great Northern Diver was still along the East side between Wick Green Point and East Shore. Six adult Mediterranean Gulls were found in the roost this evening, and a Green Sandpiper was on Herriott's Pool this morning. The Great Northern Diver was off Spring Bay this afternoon, and the Yellow-browed Warbler was still in residence at Chew Stoke STW. Three Mediterranean Gulls (two adults and a first-winter) were on the Roman Shallows this afternoon, and the first-winter Little Gull was still off Denny, but a real surprise was an exceptionally early Sand Martin which flew north over Herriott's Bridge this afternoon, beating the previous earliest 'Avon' record by two days. Before today, the earliest were two at CVL on Feb 25th 1990. At least seven Mediterranean Gulls (six adults and a first-winter) were seen in the roost and at Herriott's this afternoon. The Yellow-browed Warbler was still present at Chew Stoke STW this morning, and the Great Northern Diver is still around - this morning off the main dam, and this afternoon in Stratford Bay. The gull roost this evening produced five Mediterranean Gulls (four adults and a first-winter). The first-winter Little Gull was still present on the lake this afternoon, and two Bramblings were at CVRS. Six Mediterranean Gulls were seen in the roost this evening. Despite the splendid weather, few people ventured far beyond Herriott's Bridge this afternoon, it seems, waiting for the reappearance of the Franklin's Gull. It didn't appear, but there was news of it on Heron's Green Pool prior to 17:00. The main roost produced one adult Mediterranean Gull (with a second bird seen in flight over the Bridge this afternoon), and an adult Ring-billed Gull, which was seen from Stratford hide. Two Water Pipits were seen at Heron's Green Bay/Nunnery Point. Adult Herring Gull - Herriott's Pool 17/02/08. Something to brighten the page up a bit; back to business as usual with another seagull oddity. 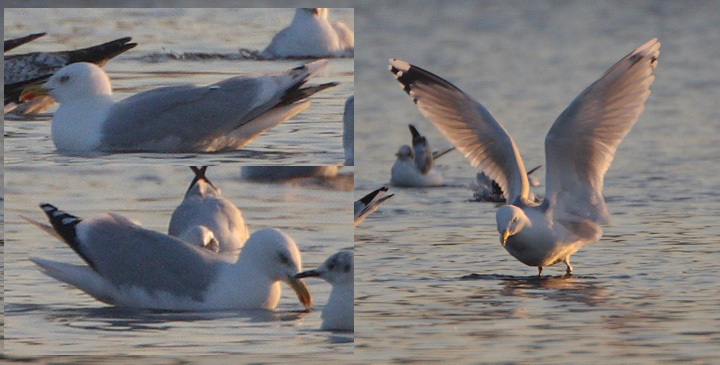 The right wingtip pattern of this bird looks pretty good for a normal argentatus (although the mantle colour was closer to argenteus), but the left primaries are clearly not normal! Every now and then we get some funny-looking wingtip patterns to pore over, but ones as asymmetrical as this are unusual. The Franklin's Gull reappeared this afternoon on Herriott's Pool - it was watched bathing with the other gulls for about five minutes, after which it flew over the road into the main roost. At Nunnery Point, there was no further sign of the Franklin's (although to be fair, the roost was so far away this evening that it was barely discernible with the naked eye) but at least six Mediterranean Gulls were found. The first-winter Little Gull was seen off Denny this afternoon. Both the Franklin's Gull and the juvenile Glaucous Gull were seen in the roost tonight, plus an adult Mediterranean Gull. Please remember that you need a permit from Woodford Lodge to view the roost from Nunnery Point. The Yellow-browed Warbler was seen again at Chew Stoke Sewage Works (directions at the bottom of this page), and the Franklin's Gull again appeared in the main roost this evening, although it was very distant. Two Mediterranean Gulls (second-summer and adult winter) were in the roost. A Jack Snipe was seen between Moreton and Stratford. The Yellow-browed Warbler remains at Chew Stoke Sewage Works. Two Black-necked Grebes were in Heron's Green Bay, and two Water Pipits and a Stonechat were seen along the track to Nunnery Point. The Franklin's Gull was seen again on Herriott's Pool, and then later in the roost, where three Mediterranean Gulls were also present. The second-winter/summer Franklin's Gull reappeared in the roost tonight, along with two adult Mediterranean Gulls and an argentatus Herring Gull. The Yellow-browed Warbler was still present at the sewage works this morning. Three Mediterranean Gulls were seen in the roost this evening, and the Little Gull was still on the lake. A Bittern was seen in flight in Stratford Bay this afternoon (flying towards CVRS), but an unexpected highlight was a juvenile Glaucous Gull in the roost. Whilst this might be expected fare in those Midlands roosts, at Chew this is still a quality find - in fact counting up the totals there have been about five times more Ring-bills seen here than Glaucs. The Yellow-browed Warbler was reported as being still present. The Great Northern Diver and first-winter Little Gull were both still on the lake today, whilst other birds seen around the margins today included Water Pipit, Woodcock, Redpoll and three Siskins. The Great Northern Diver and Yellow-browed Warbler were both still present today, whilst another Nordic Jackdaw was found in trees behind the Blue Bowl car park. The Yellow-browed Warbler was still at Chew Stoke Sewage Works today. On the lake, the first-winter Little Gull was still present (around Denny), an adult Mediterranean Gull was in Stratford Bay and three Redpolls were seen at Herriott's. No sign again of the Franklin's Gull at Herriott's this afternoon; the roost (from Nunnery Point in gale-force south-easterlies) produced two adult Mediterranean Gulls. Strangely, the main roost this evening consisted almost exclusively of Common and Herring Gulls; Black-headeds (presumably roosting somewhere on the lake more sheltered) and Lesser Black-backs were conspicuous by their absence. There appeared to be at least one Nordic Jackdaw on the Parkland late this afternoon. The Yellow-browed Warbler was still present this afternoon. Once again the Yellow-browed Warbler showed well at Chew Stoke Sewage Works; there were also two or three Chiffchaffs there today. The Great Northern Diver was just off Moreton this afternoon, and from Herriott's this afternoon were two adult Mediterranean Gulls and another Chiffchaff (on one of the islands at the back of the pool). No sign again of the Franklin's Gull, but a Bittern was reported here this morning - only the second sighting of the winter. From No.1 picnic site, leave the lake and go up Denny Lane, just opposite the picnic site exit. At the brow of the hill there is space for two or three cars. Go round the locked gate, and walk down the hill along the road towards the pumping station. At the bottom, just before the bridge over the river, there is a footpath signed on the right which goes through a small (very muddy) wooded area, over a small wooden bridge and out into a field. You will see a wooded area on your left on the other side of the river, and shortly after you will see the sewage works through the fence as the trees thin out. Continue just past the works and follow the river to the next field where there is a very sharp ox-bow just to the north of the works. There is a narrow 'peninsula' which you can walk down to view the bushes around the fence on the north side of the settling beds. It seems to stay in an area along the mesh fence just opposite where you view from, and has been quite easy to see. Click here for a map - the red circle indicates the place where the bird can be viewed from. No sign of the Franklin's Gull this afternoon, however a remarkable count of 22 Ravens was made from Herriott's Bridge this afternoon, along with four Mediterranean Gulls.